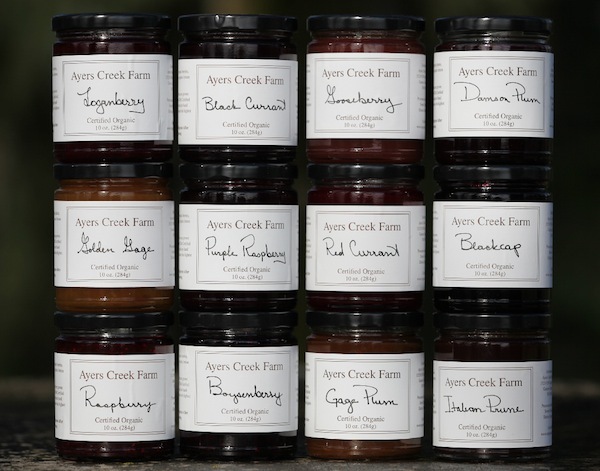 The first time I tasted the preserves from Ayers Creek Farm, it was their black cap jam, and I was bowled over by the intensity of the fruit that burst from it. Subsequent jars of plum, blackberry, raspberry and quince jelly each carried the same concentrated flavor intrinsic to its particular fruit, and I've found very few other preserves that can match it. Here contributor Anthony Boutard reveals the secret to their preserve-making prowess, and why other brands may never measure up. Our preserves are made from the farm's fruit only. If the fruit is shy in the field, it is shy in the kettle and then in the jar, but we hope never shy on toast. The fruit is predominantly the first run from the field, the very best for processing because it has high acidity, along with high aromatic and pectin content. Lots of character and an outgoing disposition. Acidity, not sweetness, defines a fruit. Paradoxically, on most berry farms this highest quality fruit is left to over-ripen or rot because there is not enough to justify mustering a crew to harvest it, let alone the time and fuel needed to deliver such a small quantity. The economics of berry production are tight. Fortunately, we are diverse enough that staff can harvest for a hour or so in the cool of the day, and then set up irrigation and perform other essential tasks. And we only have to deliver the fruit to one of our freezers. Because of the fruit's quality, we achieve a good set without adding commercial pectin. We freeze the berries whole in the harvest crates without crushing them. This preserves the aromatics and avoids any enzymatic degradation while the fruit is freezing. For the plum preserves, staff harvests a blend of firm, acidic fruit and riper, more aromatic fruit. The mix lends more character to those preserves. Most are processed using 750 grams of sugar per kilogram of fruit, and freshly squeezed lemon juice. The currants and jostaberry are prepared using 950 grams of sugar per kilogram of fruit. All are cooked in two gallon lots using a set of four small steam kettles. We use sensitive digital thermometers to track the temperature of the fruit. We generally shoot for 220-221°. However, each of the 15 fruits cooks differently, and they vary from year to year. This year, the purple raspberry set at 216°, the lowest we have ever seen in our fruit. Still scratching our heads over that. The behavior in the pot indicated a set had been achieved, but the reading on the thermometers didn't match, so we decided with our eyes rather than the instrument. An overcooked preserve is a terrible disappointment. As a general matter, we err on the side of a runnier set rather than risk a gummy texture and dull flavor. When finished, we have concentrated about a half pound of fruit in each 10-ounce jar. When we started making preserves, we found there were all of these baffling rules of identity defining jams, conserves, jellies, sauces, spreads and preserves. We artfully dodge the identity question by avoiding any description on the label. All we do is name the fruit and ingredients. 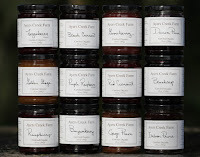 Our ability to make preserves of this quality rests on a very special relationship we have developed with the owners of Sweet Creek Foods, Paul and Judy Fuller. Since 2005, we have produced more than 35,000 jars of preserves at their factory in Elmira, about 35 miles west of Eugene. 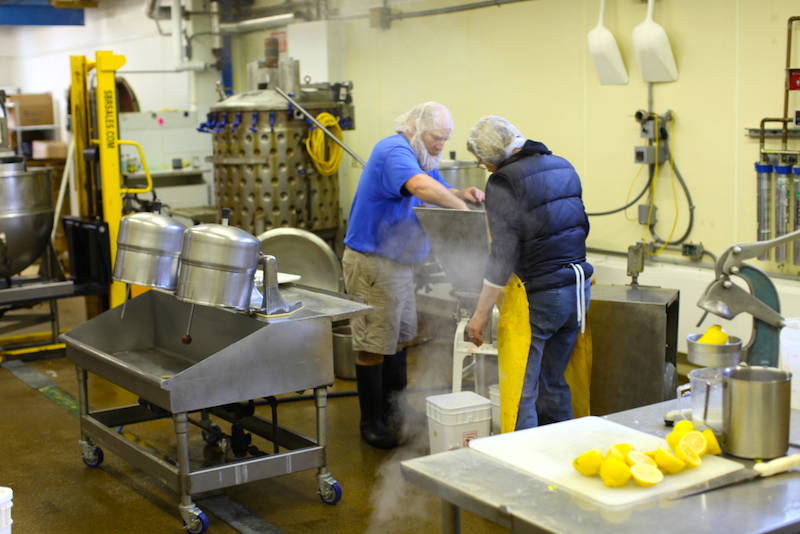 They are set up to process large quantities of fruit in several 200 gallon kettles, thousands of jars a day. The physics of cooking in large kettles require the addition of commercial pectin, something we have avoided because those pectins bind with the fruit's acids and dull the flavor. We pay extra to use the little kettles that otherwise are reserved for testing purposes, and eke out about 1,000 jars each day. As Paul notes, he could do that in an hour if we weren't so damned picky. We sweeten the deal by bringing down a huge pot of soup for Paul, Judy and their staff. The difference in price between the different types is not an indicator of quality differences. The difference reflects extra labor costs and shrinkage associated with deseeding, and removing the stems from the currants. In the case of damsons, it's the labor associated with pitting such a small plum. Jellies are their own challenge because the juice and pectins must be extracted by slowly stewing the fruit, and then drawing off and decanting the clear liquid. They are our art project, the test of our mettle as preservers with their fragile, jewel-like essence. With jellies, there is no gracious exit from a mistake. 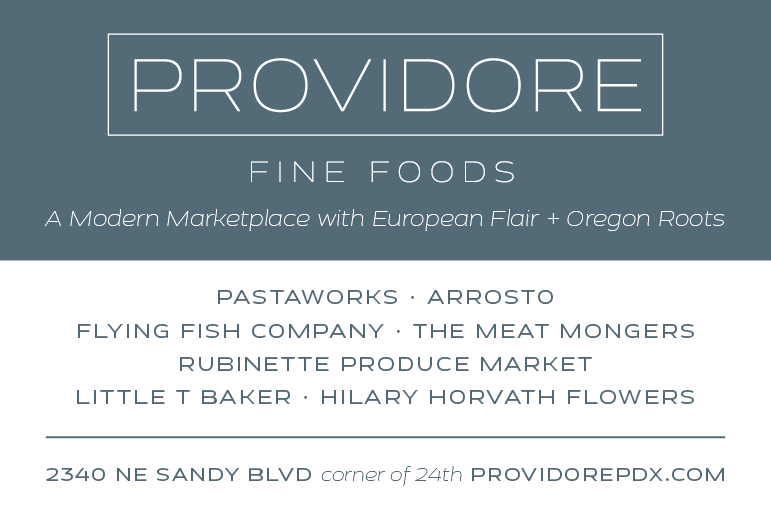 We don't have a favorite preserve as such; they all find their way onto our table. However, the one that is the true measure of our efforts is the red raspberry. Commercially prepared raspberry preserves, jams, conserves, spreads, however they are identified, are found in every grocery store in the land, and many of us had parents or grandparents who put up some raspberry jam. If we felt our red raspberry tasted the same as Smuckers or some tonier brand, we wouldn't devote the time and effort. On the other hand, we are not foolish enough to compete with memories and are very happy if the quality simply reminds you of the raspberry jam you enjoyed at your parents' or grandparents' table.